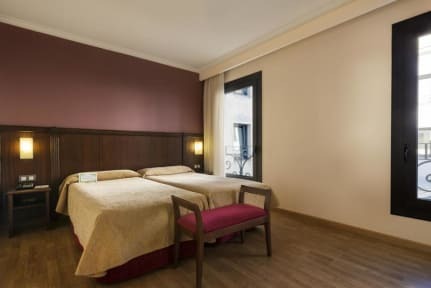 Oriente Atiram Hotel i Barcelona, Spania: Bestill nå! 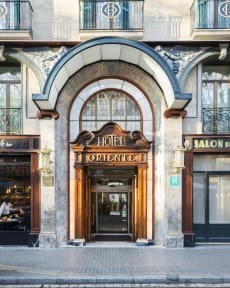 Oriente Atiram Hotel is situated besides the famous Ramblas. This area is well known for its shopping and commercial activities. Near the hotel you will also find the Liceu Theatre, the Gotic Quarter and, just a few yards further down, the seafront. Our establishment is fitted out with a total of 147 rooms, all equipped with bathroom, central heating, color T.V., direct telephone and a safe. We are very proud to point out the quality of our members of staff and their main aim: our costumers satisfaction. Our staff will make sure that you get a comfortable and pleasant stay. The Hotel Oriente has two halls, Condal and Glorieta, both of which is decorated in a classical style and is perfect for holding all sorts of events, from business meetings, conventions and conferences, to social gatherings such as banquets, cocktail parties or other celebrations. In the middle of Las Ramblas you'll find (in front the hotel) our Terrace-Restaurant, you can taste here our best paella or Gazpacho.